A Legendary Collection of Cohorts and Companions For Any Game! 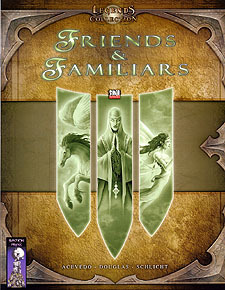 Friends & Familiars is a great book for players and DMs alike. Give your heroes sidekicks, cohorts, unique animal companions, or rare familiars with this collection of characters and critters. Whether you need helpful character to fill out an incomplete gathering of heroes, or simply a quick and easy familiar with a unique personality and history all its own, this book is sure to come in handy. Ready to use characters, monsters, and animal companions, suitable for any fantasy campaign. Full colour illustrations of every character and creature. An easy-to-use format, for players and DMs. Fully detailed backgrounds, histories and adventure hooks.